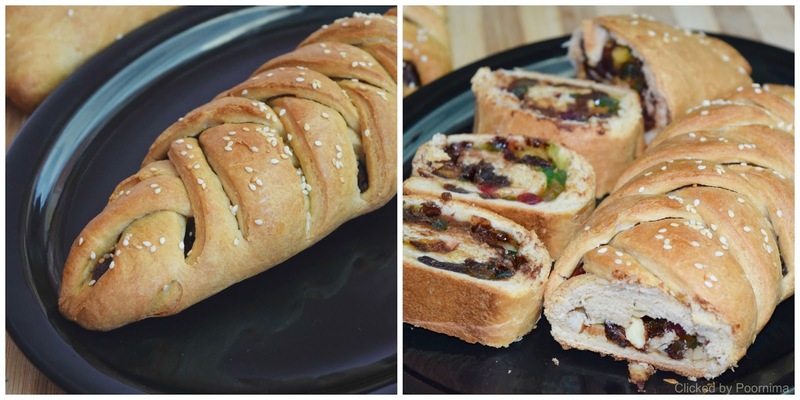 Here is a healthy, soft Bread Roll / Braided Bread stuffed with tuitty fruity, chocolate chips and dates (you can also add nuts with this). Preparing bread at home is quite interesting and easy; even beginners can try this without second thought. I have adapted the recipe from Treat n Trick, one of the famous blogs for baked goodies. Actually this recipe is given for Bread Roll, but I also tried the Braided Bread, out of my interest and it came out very well. Every one liked it as well. Also check my Jewish Challah Bread / Three Strand Braided Challah recipe which I posted earlier! Soon I will be posting more healthy & yummy stuffed baked goodies! This is my first food photo using my Nikon D5300; looking forward to your feedback! Mix melted butter, milk and warm water in a bowl. Take a large bowl add both the flours, sugar, yeast and salt. Make a well in the center of the flour and add the milk mixture; mix well to form into soft dough. Once it is raised punch the dough and divide the dough into two portions. Roll each into 8 x 11 in rectangle, spread the filling. Roll the dough into cylinder shape tightly. Firmly pinch the sides to seal. Transfer dough onto a lightly greased loaf pan. Repeat the same for the balance of the dough. Rest the dough for 1 hour. Towards the end of rising time, preheat oven at 180 C.
Brush with milk and sprinkle sesame seeds. Bake at 180 C for 25-30 minutes or until golden brown. Remove from the oven and transfer into rack to cool. Using a serrated knife, slice into thick rolls. Enjoy! The baking temperature and time will vary depending on the oven specification and bread thickness. 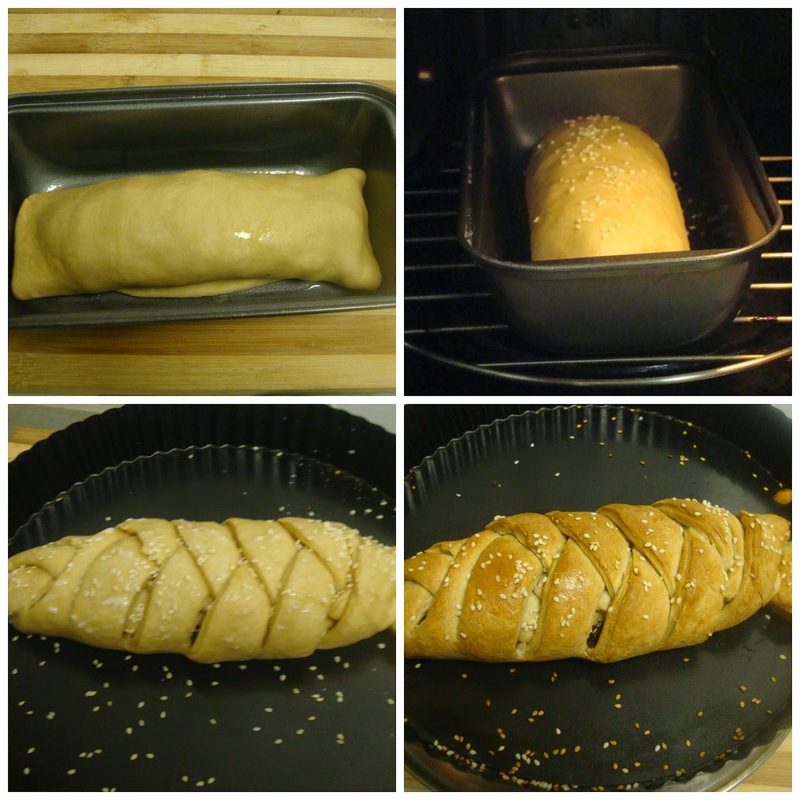 As said earlier, I tried Braided Bread using the same dough made for Bread Roll. Soon I will post step by step photos for that. Tasty, good looking & well baked bread roll. Very delicious rolls. Lovely filling..looks so inviting. Awesome rolls, and the first photograph looks great :) Keep going!